Sama, A.; Perez, C.; Rodriguez-Martin, D.; Cabestany, J.; Moreno, J.; Rodríguez, A. This paper presents the design and methodology used to create a heterogeneous database for knowledge movement extraction in Parkinson's Disease. This database is being constructed as part of REM- PARK project and is composed of movement measurements acquired from inertial sensors, standard medical scales as Uni ed Parkinson's Disease Rating Scale, and other information obtained from 90 Parkinson's Disease patients. The signals obtained will be used to create movement disorder detection algorithms using supervised learning techniques. The different sources of information and the need of labelled data pose many challenges which the methodology described in this paper addresses. Some preliminary data obtained are presented. 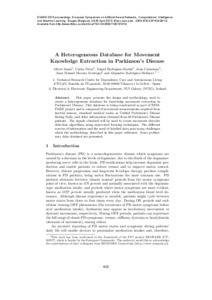 This paper presents the design and methodology used to create a heterogeneous database for knowledge movement extraction in Parkinson's Disease. This database is being constructed as part of REM- PARK project and is composed of movement measurements acquired from inertial sensors, standard medical scales as Unied Parkinson's Disease Rating Scale, and other information obtained from 90 Parkinson's Disease patients. The signals obtained will be used to create movement disorder detection algorithms using supervised learning techniques. The different sources of information and the need of labelled data pose many challenges which the methodology described in this paper addresses. Some preliminary data obtained are presented. Sama, A. [et al.]. A heterogeneous database for movement knowledge extraction in Parkinson's disease. A: European Symposium on Artificial Neural Networks, Computational Intelligence and Machine Learning. "ESANN 2013 proceedings: European Symposium on Artificial Neural Networks, Computational Intelligence and Machine Learning: Bruges (Belgium), 24-26 April 2013". Bruges: 2013, p. 413-418.